you may wish to obtain a copy of Larry Ruth's War Baby!, Volume I. Early in 1942 an advisory and oversight committee was created, consisting of personnel from U.S. Army Ordnance and each of the prime contractors. The committee changed names several times but is commonly referred to as the Carbine Committee. Out of ten primary contractors that manufactured .30 Caliber Carbines, Winchester was the only one with prior experience manufacturing weapons. When receiving their contract(s), not even one primary contractor had all the tooling necessary to build carbines. The date of the initial contract is not the date actual production started. None of the ten primary contractors manufactured all of the parts that went on their carbines. The majority of parts were manufactured by hundreds of companies that served as subcontractors to each prime contractor. Each prime contractor had to provide spare parts in addition to the completed carbines. The amount of spare parts varied. As an example, for every 100 complete carbines NPM supplied 4 trigger housings (4% extra) and 40 firing pins (40% extra). and May 1944 through December 1944. 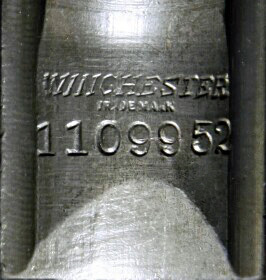 Winchester's production of the .30 Caliber Carbine was overshadowed by the production of many of the other companies as Winchester was unable to devote their full resources to the carbines alone. The Winchester name alone has increased the value of their carbines to be on a par with the company that made the fewest carbines, Rock-Ola. Received the annual Army-Navy Production Award for high achievement in the production of war material for their .30 caliber Carbine Model M1, in 1942, 1943, and 1944. In August 1943 U.S. Ordnance personnel temporarily took over Rock-Ola management to reverse management problems that had resulted in unacceptable low production numbers the three months prior. 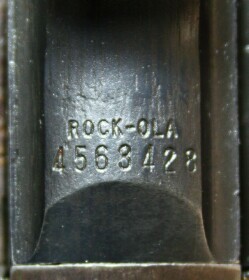 As a result, management/employee relations improved significantly, resulting in increased performance that allowed Rock-Ola to continue carbine production. Stocks and handguards manufactured by Rock-Ola have been considered some of the best looking stocks and handguards made. The one and only part manufactured by Quality Hardware was their receiver. All other parts were provided by subcontractors and other prime contractors. The production of 28,949 receivers used by Quality Hardware was subcontracted to Union Switch & Signal. The subcontractor code assigned to Union Switch & Signal was UN. In a rare play with manufacturers markings, Union Switch & Signal placed the manufacturer name UN-QUALITY on the receivers, then sent them to Quality Hardware. Produced 3,542 M1 Carbines, none of which were accepted by the government. 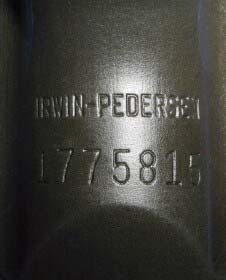 The Irwin-Pedersen contract was given to Saginaw Steering Gear, who moved into the Irwin-Pedersen facility in Grand Rapids, took possession of everything Irwin-Pedersen and their subcontractors had produced, then inspected it all and integrated these parts with parts made by or for the carbines produced by Saginaw at the Grand Rapids facility. Irwin-Pedersen receivers and parts are some of the most sought after by collectors due to their limited production. Dishonest individuals have been known to place IP markings on non IP parts. Any carbine made up of all IP parts was very likely reconstructed into that configuration. *The quantity of Irwin-Pedersen receivers assembled into M1 Carbines by Saginaw Grand Rapids is unknown. 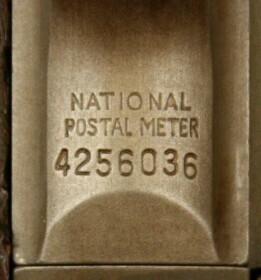 National Postal Meter Company, Inc.
A week after America's entry into WWII, National Postal Meter and the Todd Corporation partnered to start the Rochester Defense Corporation. It was this company that negotiated for the contract to produce M1 Carbines. Shortly after the approval of their 2nd contract, but before production started, Rochester Defense Corporation was dissolved and its assets merged into National Postal Meter. At the time of their first contract, the company had no tools, no employees, and no location for building carbines. National Postal Meter's test fire range was built by raising the floor of the carbine manufacturing plant three feet above the buildings concrete floor and literally shooting under the feet of the production line. Had some of the finest walnut. Performance testing gave them the highest rating in adverse conditions. National Postal Meter Company changed the name of their company to Commercial Controls Corporation on April 26, 1944. The same month they ceased carbine production. The 239 Commercial Controls M1 Carbines were assembled from leftover parts and provided to U.S. Army Ordnance in August 1945. The Commercial Controls M1 Carbines are the rarest of all manufacturers. Researchers have been trying to locate them to examine and document exactly what they were, leading many to form unsubstantiated conclusions as to their existence. Their rarity has led to the forgery of their markings, requiring close examination by a group of experts to verify authenticity. One of the many challenges facing Standard Products was where to obtain the personnel necessary to manufacture their M1 Carbines. Port Clinton, Ohio was a rural area with other wartime industries competing for a workforce. Early in WWII units were commonly made up of enlisted personnel from the same towns and counties. At the Battle of Bataan units made up of male residents of the Port Clinton area were wiped out by the Japanese. The few survivors became POW's whose next challenge was the Bataan Death March and all that followed. When Standard Products announced they needed employees to manufacture M1 Carbines, the call was answered by the wives, parents, grandparents and siblings who had lost loved ones at Bataan. Many of these workers already had jobs elsewhere. When an evening shift was started to boost carbine production, many residents stepped forward and took on the second job. In addition to M1 Carbines, during WWII Saginaw Steering Gear manufactured Caliber .30 Browning Machine Guns (i.e. M1919A4), Oerlikon and BOFORS guns, tanks, tank destroyers, vehicle subassemblies, and armor piercing projectiles. 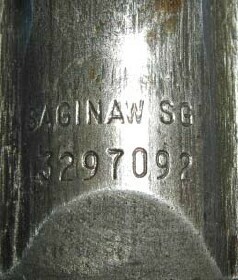 Receivers manufactured by Saginaw in Saginaw, MI had a wide recoil plate tang, like the receivers made for IBM by Auto Ordnance. For a short period of time in 1943 Saginaw in Saginaw, MI provided receivers to Inland. Some of these receivers were retained and used by S.G. and have the letters SG on the left side of the receiver. The facility at Grand Rapids was initially operated by Irwin-Pedersen. When the carbines they produced failed to pass muster with U.S. Army Ordnance, the Irwin-Pedersen carbine contract and Grand Rapids facility was turned over to Saginaw Steering Gear and operated as a second Saginaw M1 Carbine production facility. Saginaw Grand Rapids inherited all of the parts made for, or by, Irwin-Pedersen. 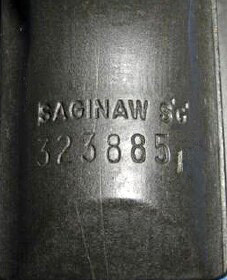 Saginaw inspected the IP parts and those that met Ordnance specifications were integrated into the carbines manufactured by Saginaw at Grand Rapids. The total carbines manufactured includes those Saginaw made using Irwin-Pedersen receivers. Auto-Ordnance of Bridgeport, CT, was initially subcontracted to manufacture all of IBM's bolts and slides in addition to 50% of their receivers. Difficulties at Auto Ordnance caused IBM to assume control of the carbine parts program at Auto-Ordnance, with IBM and additional subcontractors filling the void left by Auto-Ordnance. The IBM facility in Endicott, New York, produced 14 of the 19 parts used on the IBM carbines including the trigger housings. 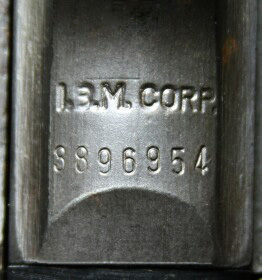 The stamped/brazed variation of the carbine trigger housing was developed at IBM's Endicott facility. 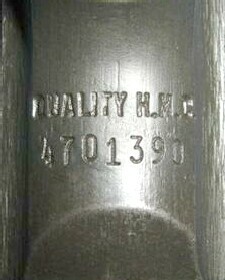 IBM receivers made by Auto Ordnance have a wide recoil plate tang and the letters AO on the bevel below the serial number. One of the challenges facing researchers in reconstructing the history of the U.S. Carbines Caliber .30 has been the loss and/or destruction of many original records. The quantities included above and the months of manufacture have been reconstructed from the research of many. Documents used to reconstruct this information have included a variety of U.S. Army Ordnance documents and documents from the various prime contractors. Some of these documents conflict with one another as the original purpose of each document sometimes differed. These documents fall into four basic categories. The documents of various government agencies have been consistent in regards to the final number of carbines accepted by Ordnance from each prime contractor. A total of 6,117,827 +/- of all models accepted by Ordnance can be considered fairly reliable. 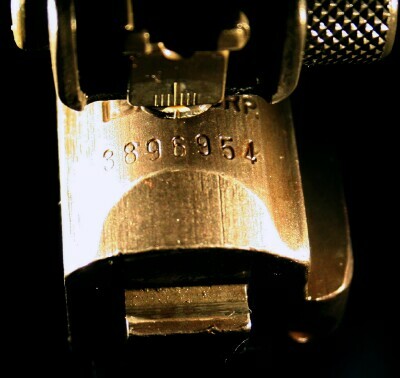 The primary contractor's name was always stamped on top of the receiver behind the rear sight. 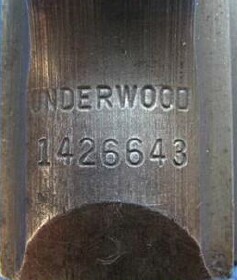 The serial number was always stamped directly below the primary contractor name. 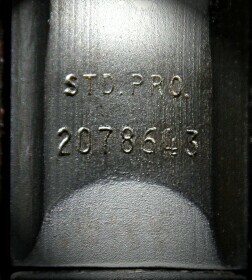 The adjustable rear sights often obscure part or all of the primary contractor's name. 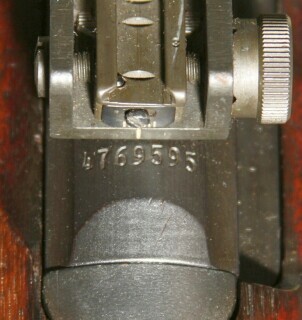 If you don't see the name, look close under both sides of the adjustable sight. You can usually make out the first and last letter or two. 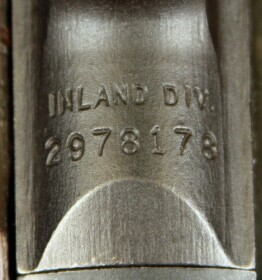 Compare the marks you find with the serial number assignments.